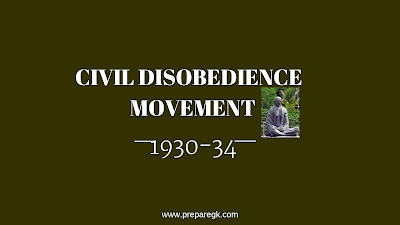 The Civil Disobedience movement was one of the most significant movement that was launched by Mahatma Gandhiji by breaking the salt laws. The Dandi March commenced on 12 , March 1930 from Sabarmati Ashram in Gujarat towards the coastal village of Dandi which is about 390 km in distance.Gandhiji with 79 followers set out on foot towards Dandi.They reached the coast of Dandi on 6 April ,1930 where Gandhiji broke the salt laws and launched the Civil Disobedience Movement. Sarojini Naidu also accompanied Mahatma Gandhi during the Dandi March. On 9,April Gandhiji laid out the programme which including making of salt in every village in violation of the existing salt laws ,picketing by women ,by shop selling liquor,opium and foreign clothes,organising the bonfires of foreign clothes ,spinning clothes by using charkha , boycotting of schools and colleges by students and resigning from govt. jobs by the people.The programme also called upon the people not to pay taxes to the govt. Soon movement spread all across the country .Students ,workers ,womens and farmers all participated in the movement with great enthusiasm. As a reaction , British govt. arrested important leaders of the congress and imprisioned them. There are different causes for the launched of this movement . The demand for the dominion status, formation of Simon Commission etc. A demand for the dominion status was raised in the Calcutta session of INC and a period of one year was given to the British to accept the congress demands. So ,this movement was launched under the leadership of Mahatma Gandhi to realised this objectives to the British. In 1927, British appointed India Statutory Commission headed by Sir John Simon to review the Govt. of India Act,1919 and to suggest legal and administrative reforms for the future. When commission reached Bombay, Hartal with black flags with the protestors raising slogan "Simon Go Back" and "Go Back Simon". All the seven members in the commission were Englishmen and their was no indian member which agitated Indians .At Lahore ,Lala Lajpat Rai was beatenin a Lathi charge and he died in 1928.